We try to make the arrangement any funeral as stress-free as possible, so you are welcome to make an appointment to visit our office, or we can visit your home, or a location of your choice. Our initial meeting will last about an hour and we will discuss every aspect of the funeral and answer any questions you may have. Music can play a pivotal part in a funeral service or can be used simply for entry and exit. Either way, music can be a wonderful way to personalise the service. Once instructed, we will source any music on your behalf and provide all audio equipment regardless of the funeral service venue. A professional organist can also be arranged. Floral arrangements are a very personal matter, so we advise using a reputable local florist and suggest you receive tributes from close family only. Once the flowers have been ordered, your florist will make contact with the funeral director and ensure that tributes are delivered at the correct time; often the morning of the funeral. An alternative to floral tributes can be receiving donations in memory of the deceased for a charity of the family’s choice. Donations are managed by the funeral director at no additional cost. A collection will be facilitated at the funeral service and the monies then held in a private donations account for up to four weeks, during which time further donations can be accepted. After four weeks we close the account and receipt you with the total sum raised; we then send a cheque to the chosen charity who should also receipt you, with their thanks. We advise a maximum of two charities for your donations. Cars can be provided on the day of the service to transport the family to and from the funeral. The driver of your funeral car will be on hand for the entire day, even waiting at the refreshment venue if required. We do not provide limousines due to our rural surroundings, but use black Ford Galaxys which comfortably seat six people. We can, however, hire limousines on your behalf if you so require. Our dedicated Chapel of Rest is available for both religious and non-religious services. It has ample car parking, seating for fifty people, a piano and an audio/music system. The Chapel can be used for a committal preceding the burial or cremation, thereby relieving the stress of having to travel to Taunton crematorium. 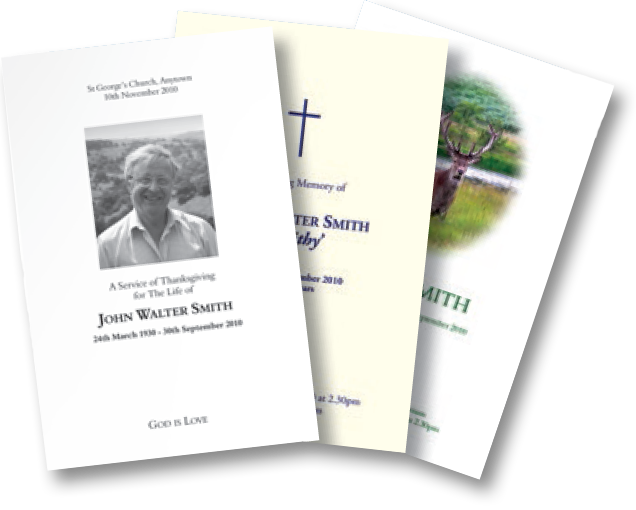 We will organise a quality printed booklet for the day of the service, produced by FIRST Design of Porlock. Personalisation of content, format and use of photos are encouraged. The A5 booklet will display the running order of the service including hymns, readings and any musical content. The Order of Service makes a precious keepsake for those who attend the service, and also for those unable to attend. A draft document will be sent to you, the minister and the funeral director for proofing purposes and final approval before actual printing takes place. We are happy to assist you with any press notices, helping to draft and proof the notice if necessary, and ensuring its publication on your behalf. This can be in local or national papers. Notices can also be published on our website for a digital audience.